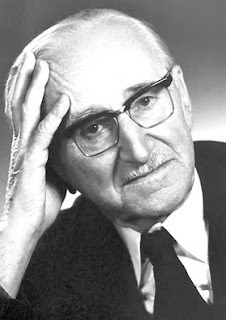 Friedrich August von Hayek was a political and economic philosopher born in Austria in 1899. He died in 1992, but with current Republicans casting about for a champion for their ideas, F. A. Hayek has achieved resurgence in popularity. Dr. Hayek believed that individuals are engaged in a battle for liberty over authority, and that authoritarian forces have the upper hand. The actions of our current POTUS make this subject timely. People like Robert Stacy McCain, Glenn Beck, and Dr. Helen Smith are keen on Hayek. He has an “OMG!” effect on people, when they see that something he characterized over 60 years ago is being played out right in front of their eyes. This is where F. A. Hayek comes in. He wrote an article in 1949 for The University of Chicago Law Review titled “The Intellectuals and Socialism.” (H/T The Other McCain) The article describes the development of socialism and makes the point that “Socialism has never and nowhere been at first a working-class movement.” Rather, it is “intellectuals” who are the first to spread the ideas. --America must cease offshore drilling. --Green energy initiatives must be subsidized to a greater extent. --Our federal government must take on a larger role. It would be interesting to know if F. A. Hayek would agree. To get a better understanding of his philosophy and perspective, go to Greg Ransom’s “Taking Hayek Seriously” site (hayekcenter.org) or visit the Institute of Economic Affairs Web site. The IEA actually has a Reader’s Digest condensed book version of The Road to Serfdom (with “The Intellectuals and Socialism” included) as a 1.25MB .pdf download. With something this convenient, we no longer have an excuse to ignore history! Mark Tapscott of the Washington Examiner writes for a column titled "Beltway Confidential". His article from today profiles Frances Beinecke, president of the National Resources Defense Council. Ms. Beinecke is one of the member of the Gulf Oil Spill panel. The title of Mr. Tapscott's article is "Don’t expect objectivity from this Obama oil spill commission appointee."